The Tangent Theta TT525P is a purpose built tactical riflescope designed to withstand harsh use in adverse conditions in order to accomplish the mission. The TT525P is the latest product from Tangent Theta that offers the long range shooter unfailing ruggedness, mechanical precision and unsurpassed image quality. 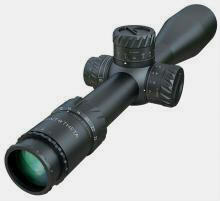 Through the use of high quality glass and lens coating, the TT525P provides exceptional image quality and light transmission as well as providing innovative features such as the Tangent Theta Tool-Less Re-zeroing System, Articulating Lens Covers, and Integrated Parallax and Illumination Knob. 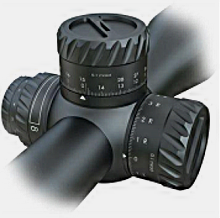 The large internal adjustment range allows the scope to be effectively used on a wide variety of platforms while the 0.1 mrad clicks makes trajectory corrections a snap when used in combination with Tangent Theta (Gen 3 XR or Gen 2 XR) or with MOA models 1/4 MOA per click ( MOA Calibrated Reticle). 28 mrad Double Turn knobs are standard on the Tangent Theta TT525P; 5-25X56 and provide 0.1 mrad click per hash mark, as well as the MTC (more tactile click) option. The double turn knob also features a revolution indicator that provides the operator a visual and tactile reference of location in the travel range. The revolution indicator automatically extends when transitioning into the second revolution.